The first violin part for the Overture from Wagner's The Flying Dutchman has been edited by Steven Staryk, renowned musician who has held the concertmaster position with some of the top orchestras in the world, including the Royal Philharmonic Orchestra at the age of 24 (the youngest ever), and earned the title "king of concertmasters" from The Strad magazine. Staryk's bowings, fingerings and other editorial markings have been added throughout the score. Wagner's The Flying Dutchman is a one act opera (sometimes split into three), often viewed as a turning point in the composer's career as it marked one of the first milestones on the road from opera to music-drama. It tells the story of a sailor and his daughter caught in a violent storm out on the sea. The leitmotifs are all introduced in the overture, which begins with a well-known ocean or storm motif before moving into the Dutchman and Senta motifs. 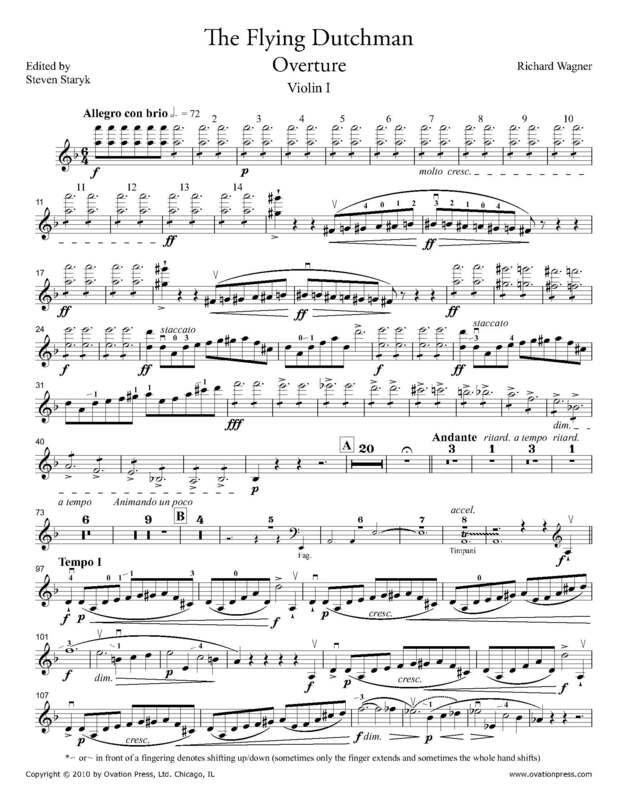 Download and print the score today to gain access to expertly edited Wagner The Flying Dutchman Overture violin fingerings and bowings from Steven Staryk!